In 1947, when we had a population of 353 million, 272 children of every 1000 live births would die before their fifth birthday - this accounted to 4.11 million children deaths. Compare this to 2015: while our population almost quadrupled to 1.3 billion, the number of child deaths reduced to a quarter at 1.2 million at a rate of 45.2 per 1000 live births. Three years ago, when I made my transition to the development sector, my view about India's public health (PH) was shaped by the media and influenced by armchair discussions with my equally ignorant friends. I had heard anecdotes of avoidable tragic deaths, read about the state of poor health facilities and huge medical staff vacancies. Commentaries on India's poor health statistics were ubiquitous. The picture painted was of not progressing enough. 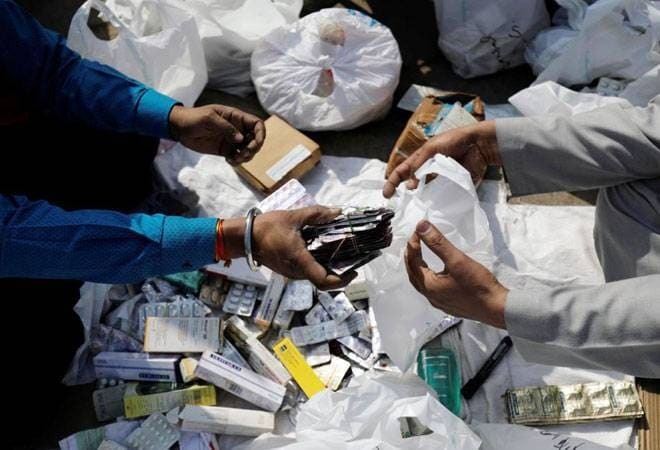 Government bashing, irrespective of political affiliations was the flavour of all armchair discussions with the typical conclusion being - 70 years post-independence, we haven't been able to provide basic health services to our populace. Instead of asking 'how is India's PH? ', I asked, 'how bad is it?'. The fact is that the current health statistics leave a lot to be desired from our system. But surely, we must have made some progress as a nation in the last few decades? While trying to understand this, I came across talks from the brilliant Hans Rosling who spent his life explaining world facts using simple data - they opened my eyes! Here, I present (using Gapminder tools) certain facts about India's public health progress since independence. 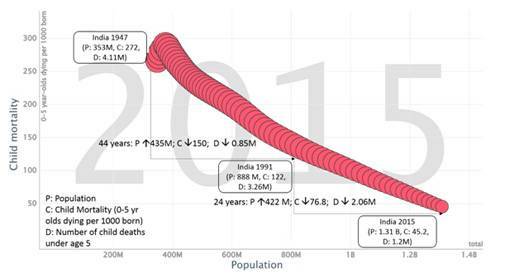 The first chart plots India's child mortality (0-5 year-olds dying per 1000 born) and population since 1947 to 2015. The bubble size depicts the number of child deaths under the age of five. In 1947, when we had a population of 353 million, 272 children of every 1000 live births would die before their fifth birthday - this accounted to 4.11 million children deaths. Compare this to 2015: while our population almost quadrupled to 1.3 billion, the number of child deaths reduced to a quarter at 1.2 million at a rate of 45.2 per 1000 live births. The rate of decline has been much greater since 1991, when the Indian economy opened up (population = 888 million, child deaths = 3.26 million, child mortality = 122/ 1000 live births). The number of child deaths have reduced by two-thirds despite population increasing by 1.5 times in the last 24 years. Child mortality is a great indicator of not just how public health, but how a nation has progressed. 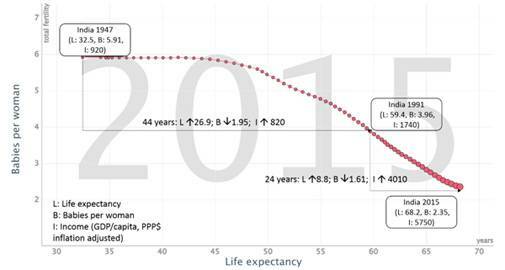 Reduction in child mortality over time subtly implies advancements on various fronts. It means more women have better nutrition and healthcare access during their pregnancies and more have their babies delivered in hospitals. It means more children have better nutrition, cleaner water and lesser infections, they have access to healthcare when they are sick, they are safer from accidents and epidemics. Society and parents have been able to provide children safer social and physical environments to grow in. This is aided by advancements in education and economic conditions. The second chart below plots number of babies per woman and life expectancy since 1947. The bubble size depicts income per person*. Poorer sections of the society tend to have larger families for various reasons - they may see children as additional hands for earning their bread, they may have more babies as insurance against child mortality. As life expectancy and incomes grow, couples start having lesser number of babies. Clearly, tremendous progress has been made since independence and we are moving in the right direction. It is important to acknowledge this growth, so that we learn from not only our mistakes, but also from the things we have done right. While things are getting better, we still have a large problem to solve. In 2015, India was ranked 154th of 195 countries on the World Healthcare Access and Quality Index published by the Lancet. More than a million children die before their fifth birthday in India every year (that is around one in every five child deaths in the world). Most of these deaths are avoidable with simple solutions like timely health check-ups during pregnancy, keeping new-borns warm, breastfeeding, nutritional counselling, etc. The problem is that these solutions are not delivered or adopted at scale with quality. Among various actors, the government is best suited to deliver healthcare services at scale. Partnerships between government, non-profits and the private sector can accelerate progress. This chart compares some of our neighbouring countries' child mortality and income per person* in 2015. The bubble size indicates the number of child deaths under the age of five. While our population is lesser than China's, our number of child deaths is higher by 6 times. 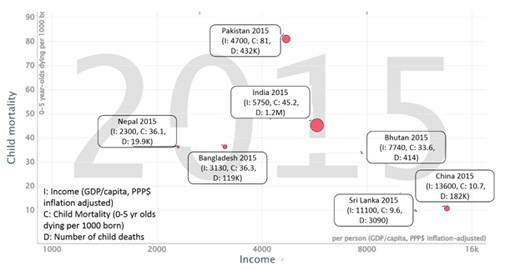 Some of our neighbours like Bangladesh (2015 child mortality rate = 36.3/ 1000 births) and Sri Lanka (2015 child mortality rate = 9.6/ 1000 births) fare better than us in maternal and child care. We need to draw lessons from their experience. They key is to create aware and active consumers who demand health services. This requires sustained community engagement to build awareness and drive behavioural change. *Note: Income per person data is GDP/capita, PPP$ inflation adjusted.